SHOWCASE SOLOS POPS is a graded series of popular song arrangements for solo piano featuring movie themes, Broadway classics, favorite children's songs, and today's top recorded hits. Each solo is expertly arranged with a winning combination of creativity and solid pedagogy. Ranging from Early Elementary through Late Intermediate levels, these exciting solos provide excellent supplemental material for any method, and are a perfect complement to the Hal Leonard Student Piano Library. 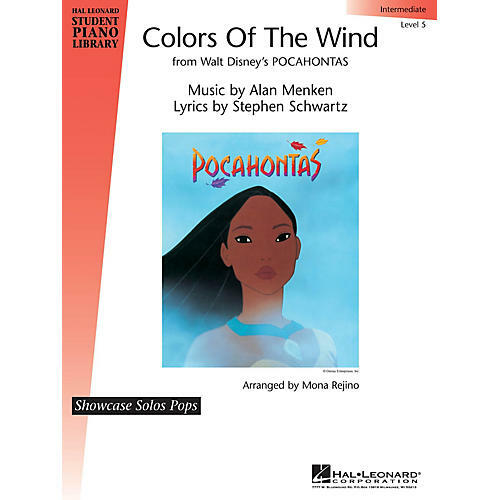 This hauntingly beautiful song from Walt Disney's Pocahontas is expertly arranged here for the intermediate pianist. Adults and teens will love to play this arrangement by Mona Rejino. The flowing melody is enhanced by an eighth-note broken chord accompaniment. This solo would make a wonderful recital piece. B-flat Major, 4/4 meter; Reading range: full staff/leger lines; Span: 7ths, broken octaves; 42 measures.